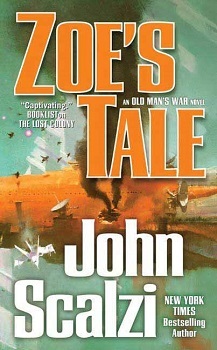 Zoe's Tale, by John Scalzi, is the fourth book set in the universe he established in Old Man's War. In large part, it's a re-telling of the events third book, The Last Colony, as experienced by the character Zoe Boutin-Perry, the adopted daughter of John Perry and Jane Sagan, both former members of the Colonial Union military. Zoe, as the result of events in the previous books (and I don't want to give too much away) is revered by the alien species the Obin. She is accompanied at all times by two of the aliens, who record her life to share with the entire species. So while the reader get to experience the events of The Last Colony from Zoe's perspective, they also get a story about a young, teen-aged girl's journey of self-discovery. I came this book right after finishing The Last Colony, so the events of that novel were fresh in my mind. As a consequence, it's hard for me to say whether this book would be as good for someone who wasn't up to date on Zoe's history and the events of the previous novel. My gut tells me that readers with experience in Scalzi's Old Man's War universe will have firmer footing and as such derive more enjoyment from this work. As I mentioned above, the book primarily relates the events of The Last Colony as seen through Zoe's eyes, while at the same time intertwining that narrative with the personal experience of teenage coming-of age, complicated by the fact that she's worshipped as a goddess by an entire race of aliens. As a character, Zoe mostly works. While there might be some teens out there as self-aware and thoughtful as Zoe and her friends, my experience with teenage children has provided strong evidence to the contrary. The result is a 15 going on 35, who sometimes acts like and angsty teen and others like a seasoned CEO of a multinational. While this inconsistency didn't overtly impact the book, it did, for me, result in a few unconvincing moments. Nevertheslees, Scalzi manages to take Zoe through a very personal journey of growth as she attempts to answer the questions so many of struggled (and still struggle) with: Who am I? What is my purpose? Why am I here? All good questions with no easy answers, or, rather, answers that are different depending on the circumstances. We all play different roles, some to fulfill our responsibilities and others to avoid them. Sometimes I don't know if my life is complicated, or if it's that I just think too much about things. Life is complicated and there are no easy answers; this is the realization most of us get, while some few spend their lives engaging in deliberate avoidance of the same truth. In the end, Zoe's Tale presents a mostly fresh perspective on the events of The Last Colony. If you're a Sclazi fan, and a fan of his Old Man's War series in particular, it's an obvious must read. If you've never encountered Scalzi before, start with Old Man's War and, if it entertains you, work your way through the rest.